Hank Potter was born on September 22, 1918, in Pierre, South Dakota. He enlisted in the Aviation Cadet Program of the U.S. Army Air Corps for Navigator training on July 26, 1940, and was commissioned a 2d Lt and awarded his navigator wings on June 25, 1941. His first assignment was as a B-25 Mitchell navigator with the 34th Bomb Squadron of the 17th Bomb Group at McChord Field, Washington, Pendleton Field, Oregon, and at Columbia, South Carolina, from June 1941 to February 1942, when he was selected for the Doolittle Mission. Lt Potter was the navigator on the first B-25 to take off from the aircraft carrier USS Hornet (CV-8) on April 18, 1942, and after bombing Tokyo his crew flew to China and bailed out when their aircraft ran out of fuel. After returning to the United States, he served as a B-26 Marauder navigator with the 95th Bomb Squadron of the 17th Bomb Group at Barksdale Field, Louisiana, from July to November 1942, and then deployed with the squadron to North Africa where he flew 23 combat missions from November 1942 to July 1943. Maj Potter then attended a War Bond tour of the United States from August to September 1943, followed by service as a combat advisor to the 39th Bomb Group at Kellogg Field, Michigan, from September to December 1943. His next assignment was as a Tactical Air Inspector at Colorado Springs, Colorado, and then at Bolling Field, Washington, D.C., from January 1944 to May 1946, and then as Chief of the Operations and Training Division with Headquarters Strategic Air Command at Andrews Field, Washington, D.C., from May 1946 to June 1947. 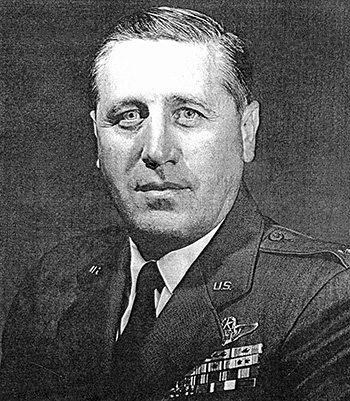 Col Potter attended Bombardier training at Mather AFB, California, from June 1947 to August 1948, and then served as a Navigator-Bombardier and Air Inspector with the 1st Experimental Guided Missile Squadron and the 550th Guided Missile Wing at Eglin AFB, Florida, from September 1948 to February 1951. His next assignment was as an Operations Officer and Air Inspector with the Air Force Missile Test Center at Patrick AFB, Florida, from February 1951 to October 1953. After completing additional training at Mather AFB, Col Potter served as a Plans Officer with the 49th Air Division at RAF Sculthorpe, England, from November 1954 to May 1956, and then as Operations Officer for Detachment 1, 1141st Special Activities Squadron in West Germany from May 1956 to September 1958. His next assignment was on the staff of Headquarters U.S. Air Force in the Pentagon from September 1958 to August 1963, followed by NATO Air Defense College in Paris, France, from August 1963 to February 1964. He served as Chief of the Nuclear Operations Section of the Nuclear Activity Branch in the Operations Division of Detachment 1, 1141st Special Activities Squadron at Louveciennes, France, from February 1964 to August 1966, and then on the staff of the 602nd Tactical Air Control Group at Bergstrom AFB, Texas, from August 1966 until his retirement from the Air Force on March 1, 1970. Hank Potter died on May 27, 2002, and was buried at the Cook-Walden Capital Parks Cemetery and Mausoleum in Austin, Texas. For extraordinary achievement while participating in a highly destructive raid on the Japanese mainland on April 18, 1942. Lieutenant Potter volunteered for this mission knowing full well that the chances of survival were extremely remote, and executed his part in it with great skill and daring. This achievement reflects high credit on Lieutenant Potter and the military services. 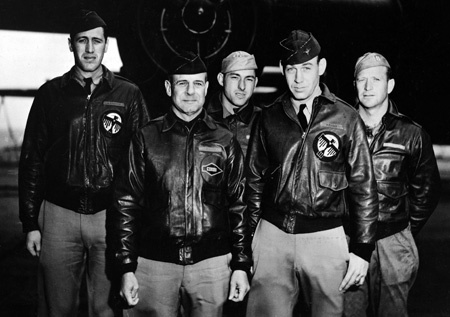 Crew 1 of the Doolittle Raiders, left to right-Lt Henry A. Potter, LtCol James H. Doolittle, SSgt Fred A. Braemer, Lt Richard E. Cole, SSgt Paul J. Leonard.